A sensitive biography of the author of Little House on the Prairie. 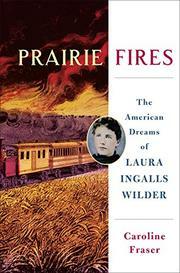 Many books about Laura Ingalls Wilder (1867-1957) have stirred up controversy about her writing career and political views. William Holtz’s The Ghost in the Little House (1993) ascribes considerable authorship to Wilder’s daughter, Rose Wilder Lane; Christine Woodside’s Libertarians on the Prairie (2016) presents compelling evidence for Wilder’s ultraconservatism. Fraser (Rewilding the World: Dispatches from the Conservation Revolution, 2009, etc. ), editor of the Library of America edition of the Little House books, offers a cleareyed and well-documented examination of Wilder’s life, writings, and career; her relationship with Rose; and her politics. Deeply respectful of Wilder as a writer, she deems Little House on the Prairie “a classic work” and “a cultural monument” that, although fiction, tells “the truth about settlement, about homesteading,” and about farmers’ “astonishing feats of survival,” which Wilder experienced firsthand. As a child, she was “constantly uprooted and often imperiled”; married at 18, she faced years of “exhaustion, failure, and regret.” After her husband was crippled in an accident, compromising his ability to farm, Wilder, in addition to farm work, took odd jobs. When Rose, a journalist, suggested publishing as a way to make money, Wilder eagerly recorded memories of prairie life. Rose served as editor. Fraser portrays the domineering Rose as erratic, angry, depressive, and self-destructive, repeatedly causing “ruination to herself, bringing her life down around her ears.” She compulsively poured money into house renovations and lavish travel, often leaving herself destitute. Like her mother, she was adamantly opposed to Franklin Roosevelt’s New Deal; she was anti-Semitic, “an apologist for dictatorial regimes,” and a champion of Ayn Rand’s work. The literary collaboration between mother and daughter was “a competition” between “Wilder’s plain, unadorned, fact-based approach versus Lane’s polished, dramatic, and fictionalized one. In Wilder’s autobiographical work, ‘truth’ would become a battlefield.” What emerged was a nostalgic life story, “reimagined as an American tale of progress,” that catapulted Wilder to fame. A vivid portrait of frontier life and one of its most ardent celebrants.